Women's March leader Tamika Mallory appeared on "The View" and defended her relationship with Louis Farrakhan. She refused to condemn his anti-Semitic statements, even after being grilled by Megan McCain. "I didn’t call him the greatest of all time because of his rhetoric, I called him the greatest of all time because of what he’s done in black communities," Mallory told the panel. Actresses Alyssa Milano and Debra Messing both denounced the Women's March a few months ago over this same issue. Milano initially said she wouldn't speak at the event as long as Linda Sarsour and Tamika Mallory were part of the group's leadership and they refused to condemn Farrahkan's anti-Semitic remarks. Sens. Kirsten Gillibrand (D-NY) and Kamala Harris (D-CA) also said they would not be making an appearance, despite speaking at previous Women's March event. Now more than ever, women need to unite against hate. The Women’s March, Inc. organization has become an essential part of the feminist movement. As feminists, we are passionate about the force behind this movement and its significance. More than 2.6 million people participated in what was the largest protest in US history on January 21, 2017. We built it. We should decide who steers it. We are aware that many separate grassroots groups participated on that day who are not connected to Tamika Mallory, Linda Sarsour, Bob Bland, or Carmen Perez. 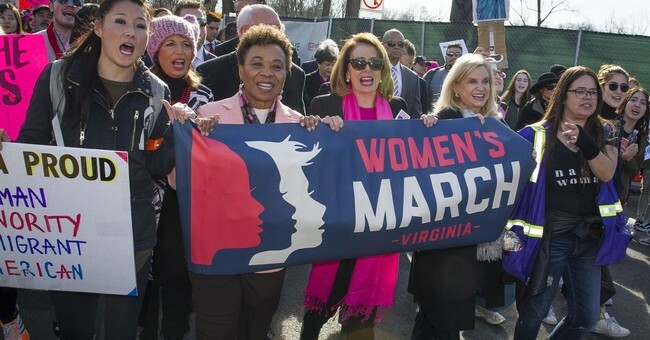 However, the march itself was organized under the umbrella of Women’s March, Inc. and we must purge it of hate. The petition has 8,628 signatures as of this writing. Their goal is 10,000.